We offer many opportunities to practice in the field through community involvement, tutoring, student-run organizations and off-campus study. The Department of Education is a nationally accredited professional certification program, which means that you’ll graduate ready to begin your career. Through the three levels of our Teacher Education Program you’ll get valuable classroom experience, including student teaching, and earn certification to teach in elementary or secondary classrooms. Most students graduate in four years. You can do other things with your teaching degree than teach in a classroom. Check out all your options and see what Hope education graduates are doing. All teaching candidates begin by taking the same Level 1 courses in our Teacher Education Program. This course sequence is designed to help you make sure that teaching is the right career for you. That’s why you’ll get classroom field experience with your very first course. Once you’ve completed all Level 1 coursework and clinical experiences, you’re eligible to apply for admission to the Teacher Education Program. Once accepted, you’ll finalize between the Elementary and Secondary education tracks and pick the subject area majors, minors and endorsements you want to pursue. Our faculty is diverse and well-versed in many specialities, and can help guide you to the career you’re looking for. Finally, in Level 3, you’ll complete the Student Teaching Program. Student teaching is an intensive, semester-long clinical experience and the capstone of the Teacher Education Program. You must apply to the program and complete student teaching successfully to receive your certification to teach in the State of Michigan. 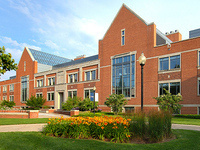 The Hope College Teacher Education Program is granted Accreditation by the Council for the Accreditation of Educator Preparation (CAEP) for a period of seven years, from October 2012 to October 2019. This accreditation certifies that the forenamed professional education program has provided evidence that the program adheres to CAEP's quality principles. In compliance with this accreditation, we have made available our Title 2 Report and our Annual Reporting Measures. The Hope College Education Department has been awarded one of six ISTE seals in the nation "in recognition of the education department's exemplary models of integration of the ISTE NETS*T into their Teacher Education Program." View a list of teacher shortage areas, published by the US Department of Education. Sign into your Chalk and Wire account. The Education Department has earned the maximum number of years for accreditation from the TEAC, through 2019. Our job placement rate is consistently strong — a majority of our grads are in schools, teaching. Our program typically graduates one-sixth of the entire graduating class at Hope College. Through our field placements and student teaching, between 350 and 400 of our students work and learn in local schools each semester.